Recently I decided to make a change to my spice drawer. I purchased 4 single spice racks from the Container Store for only $3.99 each, making this a very affordable project with great end results. These racks can be hung on the inside of a cabinet or cabinet door. Once I installed these in my cabinet I had a lot of room on my pull out drawer to add more items. In the before picture you can see all of the wasted space. In the after picture you can see how I utilized this space and gained more storage. I also added a pull out clear container to hold my extracts and spices. The clear container is on my pull out drawer. This is also a great project to purge those outdated spices. 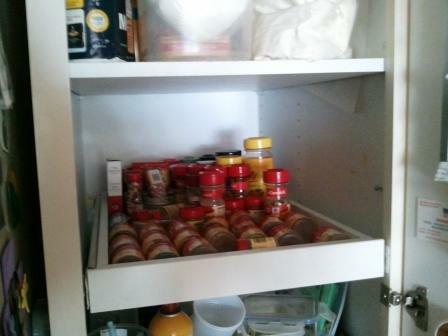 When is the last time you checked the expiration date on your spices? 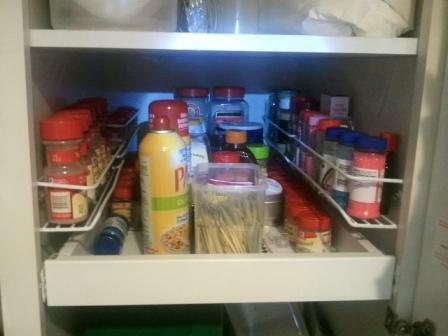 Are your spices organized? 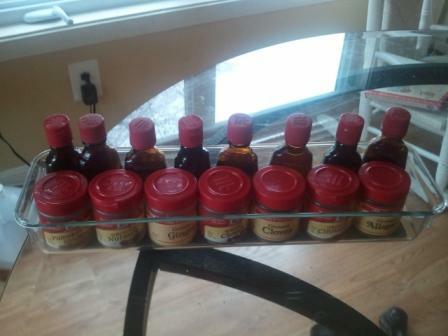 If your spices are organized these racks are also great for holding medicine or vitamin bottles. This entry was posted in Residential Organizing and tagged Inspiration, Kitchen Organizing, Organizing a Pantry, Pantry Organizing, Products. Bookmark the permalink.